Whenever football is played, tables are laden with food. All kinds of food. To sustain the spectators who are putting so much of themselves into coaching, replaying and predicting the game. To soothe the wounds when the coach (one who actually gets paid), the player on the field, or the insert adjective referees don’t meet expectations. To give ordinary people a safety zone from enthusiastic fans who suddenly leap up, shouting and waving their arms. I’m here to make the case that appetizers can be eaten on other occasions. A light supper. A holiday party. A gathering of friends just to catch up. Celebration of a life milestone. Watching a chick flick. Or reading an adventure series – just remember to keep one digit clean to advance the e-reader page. Whenever you want, really. 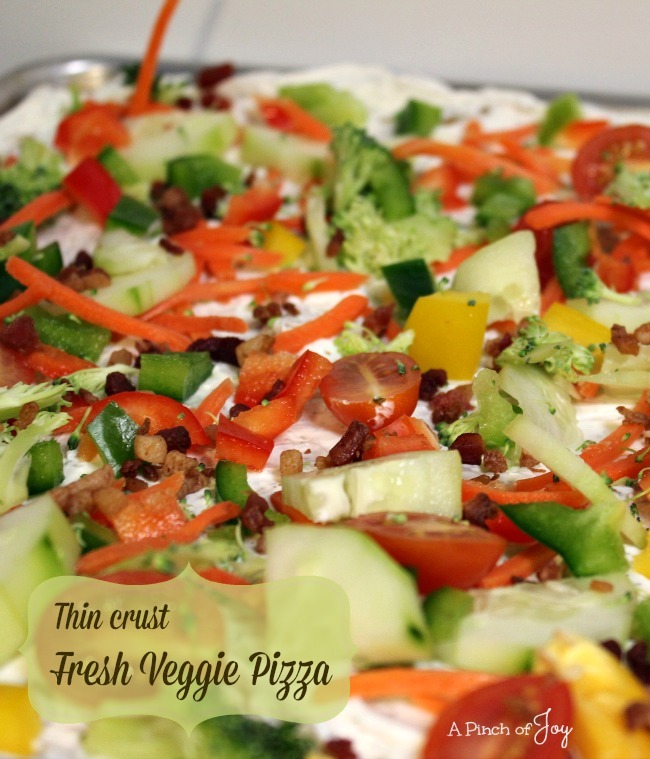 A light, semi healthy appetizer like Fresh Veggie Pizza is a good start for diversifying your appetizer habits! Bake the crust and prep the veggies ahead of time. Assembly is a snap and gives you a stunning burst of color to carry to the table. You can even shape the crust like a football the first couple of times you make it – just while you make the difficult transition to realizing appetizers can be eaten for other events. Fresh vegetables atop crispy crust and creamy base provide a burst of color and nutrition for your appetizer table! Unroll crescent dough on center of ungreased 10x15 baking sheet Press dough thinly without tearing, to cover bottom and side of sheet forming crust. Bake for 11-14 minutes or until golden. Cool. Mix cream cheese, sour cream, dill, garlic and Italian seasoning until smooth. Top with vegetables and bacon, sprinkling each on evenly over the cream cheese mixture. Can serve immediately, but best if refrigerated for an hour before serving.